The 2018 MLB Season is all wrapped up with a World Series champion and the awards passed out. Despite another amazing MLB season in the books, it could possibly be the end of an icon that could possibly be gone from baseball for good and without a ring to show how great he was. That icon is former Major League Baseball manager Buck Showalter who is no longer the manager of the Baltimore Orioles. Showalter who was let go after one of the worst seasons any manager has seen, will walk away without the glory of a World Series Ring and with many still asking themselves if he was a great manager. While we can debate over that, the resume of success Showalter has put together is unmeasurable by just one ring or even two rings. As you look at the success Showalter has had, and the more you do your research we believe you will agree. Major League Baseball manager Buck Showalter is no longer the manager of the Baltimore Orioles. For Showalter, his coaching career started with the New York Yankees in their Single-A posting 114 wins over his first two seasons. The success would continue as Showalter would continue to rise through the Yankees organization. His success would include leading one team to the best record in the league and a Minor League Manager of the Year Award before joining the big league club in 1990 and taking over as manager in 1992. The Yankees would go on to post a 313-268 record with Showalter as manager including posting the best record in baseball during the strike season in 1994. A year later, the Yankees were in the first playoff appearance since 1981. The Yankees club he helped build would go on to win the 1996, 1998, 1999 and 2000 World Series titles. It wouldn’t take long for Showalter to land his next coaching gig with the Arizona Diamondbacks in 1996. In just the team’s second season, Showalter guided the Diamondbacks to an impressive 100-62 mark and a playoff trip before another heartbreaking loss to the New York Mets. Showalter would coach for another year before leaving the Diamondbacks with a 250-236 overall record. While the ring was still not there, Showalter helped build this team from the ground up including acquiring stars like Randy Johnson and Curt Schilling. The following year after Showalter left, the Diamondbacks won their first World Series crown. Despite the success, Showalter remained out of baseball for the following two years before taking over a Texas Rangers ball club that finished in last place in 2002. Showalter would guide the Rangers to an 89-73 record falling just short of a post season trip while landing him his second AL Manager of the Year Award. Showalter would leave after four seasons with the club failing to land the club into the playoffs. Three year later the Rangers would play in their first back to back World Series. The same history would repeat itself as Showalter landed his second gig with ESPN before being hired by the last place Baltimore Orioles in late July of 2010. The club would go on to win 34 of their final 57 contests that season. Two years later, the Orioles posted their first winning season after 14 losing seasons before guiding the club to the 2014 AL East crown earning him his third Manager of the Year award. Showalter helped turn around another losing club while landing them in the post season three times over his seven plus years with the club. Only time will tell how their story will turn out. As you see, while he walks away from the game of baseball without a ring. His success and the teams’ successes following his departure showcases how good of a manager Showalter was. 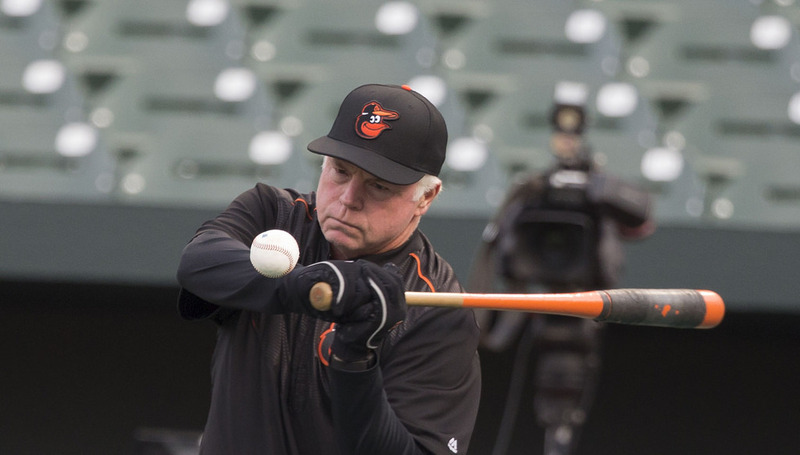 Will this be the end of Buck Showalter? For now it looks that way, but as fans we hope this is just another chance for him to turn around another losing club.